Nothing short of amazing. This 62 year old female walked into my office beaming. She drove more than an hour to my office, something she had been incapable of doing for many years. This patient had been dealing with 2 sick family members over the past years and had neglected herself. Over the last 2 years her family had become progressively concerned. She was loosing the ability to function. She could hear something repeated ten times over only to forget it moments later. She was experiencing a rapid, global decline in cognitive functioning and the ability to manage activities of daily living. She had a long history of Lyme disease but had been non-compliant with therapy. She complained that every medicine gave her side effects: a moot point since she never remembered to take them. We skipped the SPECT scan and went right to a PET scan. These are both nuclear medicine scans which make observations regarding brain function. A SPECT images blood flow: areas of the brain which are not functioning have decreased/abnormal blood flow and therefore oxygen utilization patterns. The PET images tagged glucose and actually images areas of the brain that are specifically not metabolizing sugar, not working/nonfunctional. The PET is approved for an adjunct in making the diagnosis of Alzheimer's disease. Her PET showed classic signs of Alzheimer's disease. With these results the patient was now worried and agreed to attempt to treat Lyme disease in earnest. And as one of her astute neurologist astutely: Alzheimer's doesn't get better. She has. On my recent exam I could find nothing significantly wrong with her memory. Doctors frequently assess mental capacity with a mini-mental examination. She did great. She could count backwards from 100 by serial 7s; she could recall three items after 5 and 10 minutes and she could spell WORLD backwards. Her affect showed clarity I have seen in 5 years. So what happened? IV antibiotic therapy. I started treating her with Rocephin. Chronic pain melted away which was a great relief but her mental status was not quick to change. I then added Flagyl, a drug which fights the strange pleomorphic (cyst-like) forms of Borrelia in the brain. After 3 months her brain was not significantly better. Now after 4 1/2 months there is a real change. My patient did something else as well, with my approval under my radar. We ordered IV glutathione which she has been receiving every other day for the last month. I don't know yet, but this could be a game changer. Glutathione is the master antioxidant on a cellular level and it is critical for detoxification on a cellular level. Chronically ill patients are generally deficient. Many patients have reported that intermittent doses of IV glutathione in their doctor's office have been very helpful. Having a PICC provided convenient access. I am hearing a lot about methylation. The induction of methylation pathways promotes glutathione and this can be achieved with a number of supplements, primarily various forms of B12 and folate. Active forms of B12 including methylcobalamine and hydroxycobalamine are taken under the tongue with special forms of folic acid such as Folinic acid. The recommended protocols are a bit more complex. It makes me wonder if this might be why patients frequently have a lot of energy after receiving B12 shots. Maybe not a placebo effect after all. The simultaneous use of hyperbaric oxygen therapy also augments the effectiveness of antibiotics for brain recovery. Hyperbaric by itself, results published (for what its worth), at low pressures, about 1.5 ATA is associated with significant cognitive improvements. As I ramble on.... the snarky (for what its worth) comment has to do with how doctors like me look at medical studies with our distrust of "evidence based medicine." Perhaps it is a little hypocritical for us to throw out the studies that deny chronic Lyme but keep studies that prove things we believe in/agree with. Well lets not go overboard and throw out the baby with the bath water. Some studies are useful. Anyway, the "denialist" studies never proved their point: they were poorly designed with built in biases and them misinterpreted. In my blogs there is a recurring theme: medicine is a healing art, not a science. But studies and science have a great deal of value. The help us understand mechanisms and at times point us in a direction. My patient today is a 60 year old female who has suffered with severe Lyme disease for more than 3 years. At one point she was mistakenly diagnosed with tertiary syphilis. Most recently symptoms have included: burning sensations, numbness, twitching, palpitations, flulike symptoms, difficulty walking with leg weakness, double vision, forgetfulness, brain fog, joint pains and mood swings. At this time she is very troubled by symptoms of head and ear fullness. I will tell you a little bit more about my patient. She suffers with chronic hepatitis C contracted from a blood transfusion in 1989. Several years ago she was diagnosed with Waldenstrom's macroglobulinemia -- before the Lyme diagnosis. This was treated with chemotherapy and plasmapheresis and she has done quite well. Waldenstrom's is a type of B-cell type non-Hodgkins lymphoma. A paper published in 2008, Archives of Internal Medicine, Koshiol et al, reviewed the relationship between WM (Waldenstrom's) and chronic immune stimulation. Persons with autoimmune diseases had a 2-3 fold increased risk of developing the disease. In addition, certain infectious diseases were also linked to an increase risk of the disease. Prominently the authors mention Hepatitis C and rickettsiosis. Autoimmune diseases listed include rheumatoid arthritis, Sjogren's syndrome, and MS.
WM is a rare type of lymphoma. Although incurable, it can have a rather indolent course. Suffering with Hep C, lymphoma and Lyme, my patient is most troubled by Lyme. One might wonder if chronic Lyme disease might itself be a risk factor for the cancer. Hyperbaric oxygen therapy has been somewhat helpful but she still experiences a fullness in her ear and head which are very bothersome symptoms. She has only been treated for one month and we are hopeful that additional treatments will provide additional relief of symptoms. She has only had 20 sessions. My patients have done better with 40-60 sessions. There is a high pressure vs low pressure HBOT controversy. Many believe that HBOT for Lyme is only effective with the higher pressures typically available with hospital grade chambers. Pressures of 2.4 ATA are generally recommended. This equates with a diving depth of 49 feet underwater. Others have suggested that lower pressures, typically 1.5 ATA, equal to about 17 feet under water may be adequate or better. Soft portable chambers on the market generally employ a pressure of 1.3 ATA, about 10 feet under water. This is the FDA approved pressure for such devices. Many patients report excellent results with these devices and pressures. My Hyperbaric device is a bit of a hybrid. Some portable devices are built to handle higher pressures although they are not licensed by the FDA for pressures above 1.3. My portable, extra-strong chamber has 3 settings: 1.3, 1.5 and 1.6. The highest pressure, 1.6 is the equivalent of diving 20 feet down. I have found that all three pressures are effective but the higher 1.6 pressure seems to be the most effective. As an example, it worked well for this patient. I thought -- rather unexpectedly -- that a young graduate student working with Dr. Eva Sapi presented some ground-breaking results from her research looking into Morgellons disease. As she first pointed out, the disease is discounted by mainstream medicine and the CDC who call it delusional parasitosis. The mainstream belief in short is that patients with this illness are not physically sick but rather suffer from a psychiatric ailment. The young student (I apologize that I cannot recall her name) said her research delved into the Lyme-Morgellons connection. Essentially "scab" material obtained from patients suffering with the disease, some of whom were sero-positive for Lyme disease, most of whom were not, was ground up and analyzed via molecular biology techniques looking for the presence of Lyme DNA. In all cases Lyme, B. burdorferi was found to be present. Specifically Bb sensu stricto, the North American version of the disease was present in samples taken from each patient diagnosed with Morgellons disease. In some cases, surprisingly, H. pylori, the bacteria associated with stomach ulcers and other related conditions was also found. Perhaps of even greater significance was the finding that normal skin flora were essentially absent except for sparse S. epidermitis. In some corners Morgellons was already known to be Lyme associated (not previously proved) but connected to some yet undiscovered pathogen(s). The nature of the peculiar fibers has not yet been determined. The absence of other, usual bacteria in the affected skin would seem to indicate that another organism was secreting an antibiotic substance capable of eradicating normal skin bacteria. Another possibility is that another organism, whose DNA is unknown, assumes the niche inhabited by normal skin flora. The molecular techniques used in the study would not uncover fungal/mold or protozoal DNA. Organisms that produce powerful antibiotics typically belong to the mold family as seen with penicillin. Anecdotally, there is evidence that the disease responds to agents used to kill protozoa, not mold. The mystery remains. What I think is clear is that Morgellons is linked to Lyme infection in the skin; that is a distinct disease, not another presentation of Lyme like erythema migrans; that it is not a tick-borne co-infection; that although strange and mysterious, is not a disease from outer space as some have suggested; and most importantly, is not a delusion or hallucination on the part of the sufferer and/or treating physician. One can only hope that these findings will be replicated in other research and put before authorities like the CDC who will then be forced to take this disease seriously, and perhaps Lyme as well (wishful thinking). So we have one important piece of the puzzle, given to us (or at least me) unexpectedly, in a rather poorly attended seminar, from a young, somewhat diffident (and brilliant) graduate student, while most attendees were in another seminar. OK - the case is not closed. But we have a piece of the puzzle. This research will be published in a peer reviewed journal (probably PLOS) and this is very exciting news. A 26 year old woman recently sought my opinion regarding her chronic daily headache syndrome. She had been to multiple neurologists, tried nerve blocks and been treated with every migraine/headache medicine under the sun. Nothing has ever helped. The headaches have decimated her quality of life. She had a remote history of Lyme disease more than two decades before, first presenting as a toxic synovitis of a hip in a toddler. A course of antibiotics helped to some extent, but other "mystery" symptoms persisted. The headaches started in earnest 4 years ago and have only been getting worse. By chance, she came across my episode of (Monsters Inside Me) and came to see me for a recent consultation. Lyme serology is positive. From Quest the WA1(B. duncani) titer is positive, 1:256. 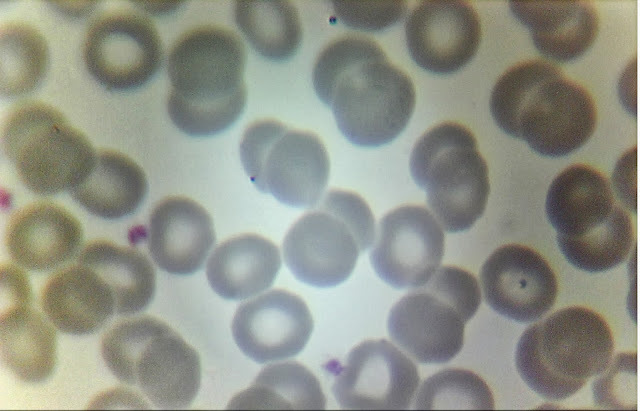 The Giemsa stain confirms the presence of active babesiosis: a potential cause of chronic daily headache syndrome. Smearing and fixing must be done immediately. These procedures and staining require a great deal of expertise. These parasites degrade quickly in blood tubes and will not be found by outside labs because of this delay. This 20 year old female has spent her life in particular town in outer suburbia where everyone sees to have Lyme disease. Over a period of many years, with many symptoms, she has asked for Lyme tests - which have always been negative, until now, September, 2013. The Lyme EIA titer was positive at 1.36 and 2/3 IgM bands were positive. Her doctors prescribed 21 days of doxycycline which has offered no help. She came to my office with her father and her boyfriend asking for my help. Seven years ago a 14 year old boy was brought into my office. He had a distant, far off gaze. This former sports star and honor's student could no longer participate in sports and his grades went from straight As to Ds. This is a case I'll never forget. He had a quiet, almost eerie "zombie-like" affect. His eyes were blank and vacant. Early on I decided he had profound Lyme encephalopathy and aggressive therapy was called for. I started him on IV Rocephin. One, then two months later, he returned for follow-up care, unchanged. I remember feeling nervous about the case. In the third month I added IV Zithromax. He returned a month later: no change. With butterflies in my stomach I added Flagyl. He returned to the office a month later, month 5 of intravenous treatment. I was amazed. A switched had been flipped: he was back. His eyes were bright and clear. This case left an indelible imprint on my psyche. But after the PICC line was removed I never saw him back. We doctors say he was "lost to follow-up." My new patient's 21 year old boyfriend said: "Hey doctor do you remember me." It took me a minute, but then I recognized him, my 14 year old now grown up. The bright eyes were still there; he had now referred his girlfriend to me. His girlfriend is very ill. She limped into my office with a cane. She was suffering with severe daily headaches. A neurologist had prescribed Topomax which seemed to make things worse. Of critical concern at the moment: she had lost 30 percent of her peripheral vision in both eyes over the last three months and the neurologist and eye specialist could not figure out why. She had been sick for a long time, years. She had a plethora of symptoms. Some of the highlights include: severe fatigue, numbness, weakness, shooting pains, a diffuse chronic pain syndrome, night sweats, shortness of breath, air hunger, back, neck and joint pains, loss of coordination, dropping things, loss of balance, confusion, memory loss, global cognitive dysfunction. Psychiatric symptoms including anger, rage, irritability, visual and auditory hallucinations. She also complains of sudden episodes of paralysis of her face and extremities. Her neurological examination showed evidence of severe neuropathy and also a loss of proprioception. When I manipulated her big toes she could not tell if the toes were pointed up or down. This is an unusual finding only seen in cases of complex neuropathy. Another word about her headaches. The pain was throbbing or band-like, behind an eye or across her entire head. The headaches typically occur twice daily lasting 4-6 hours rendering her non-functional. She had dropped out of college and also quit her part-time job. Daily headaches were fairly new over the previous 3 months. Laboratory tests were remarkable for a positive antibody against B. duncani. 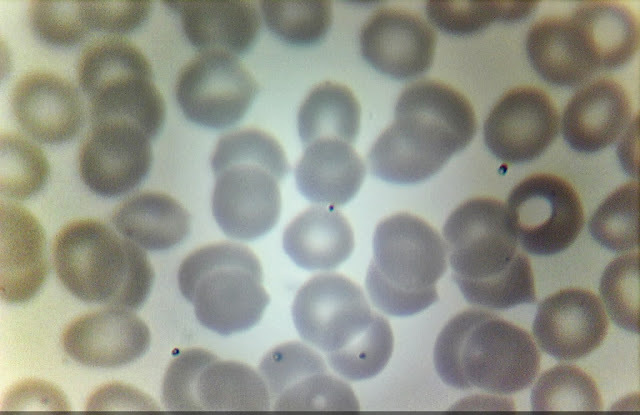 Here are some images of her blood smear Giemsa stains. The slides show ample evidence of active Babesia infection. In the third slide below a small bacteria can be seen at the periphery of a red blood cell. This is characteristic of a Bartonella-like organism. Chronic daily headache syndrome is a relatively new entity on the scene. At least some is due to tick borne disease. It is frequently written that Bartonella causes "ice pick" headaches behind an eye and that Babesia causes posterior headaches with muscle pain. Lyme can cause headaches as well. I think it is usually not possible to tease out the exact cause of headaches in persons suffering with tick borne disease. 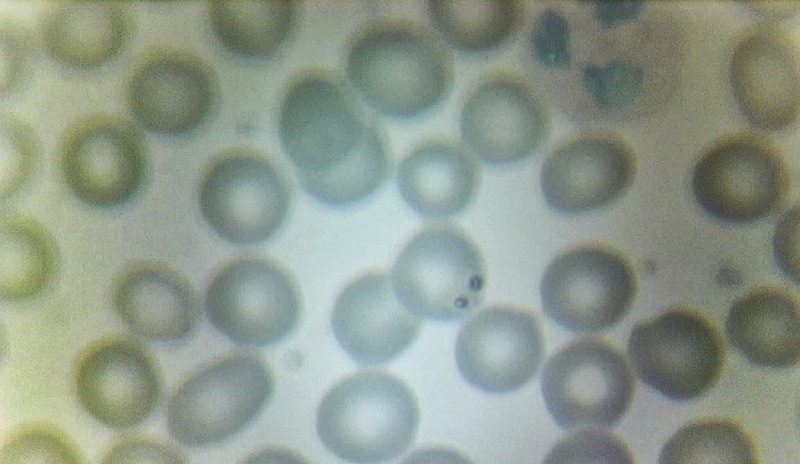 My approach to this patient is to treat Babesia but also start intravenous antibiotics. I think Bartonella will need to be addressed at a later point. PS: The boyfriend doesn't remember a lot about the time he had severe Lyme disease. He does recall walking in and out of rooms not knowing why.